There are many benefits of being a member at Platt Lane, and we don’t want you to miss out. That’s why we’re telling you what we have to offer, so you can make the most of your membership! From our high quality equipment, dedicated staff, variety of fitness classes and more! The staff at Platt Lane are a knowledgeable and friendly bunch. They are always on hand to offer advice on anything from exercise technique to nutrition. We believe our staff is what sets us apart, as there will always be a friendly faced trainer available in the gym to offer a helping hand and their expert advice. You are spoilt for choice when it comes to equipment at Platt Lane, we really do have something for everyone. Our weights room is fully equipped with free weights, benches and kettlebells just to name a few things. And we can promise you’ll never have to wait for a machine again with many treadmills, rowers, cross trainers and bikes on offer. Downstairs we have fitness studios, which again are equipped with all the necessary equipment, along with plenty of space to put down a mat and get a sweat on with your own body weight exercises. Hosted by our very own team of trainers, we will be sure to put you through your paces in one of our fitness classes. With something for all levels and abilities, we offer fun classes that will be sure to raise your heart rate! Whether it’s a spin class, Zumba, HIIT, box fit or one of the many other sessions we offer, all you need to do is turn up! And the best part, if you are a member, all classes are completely FREE! 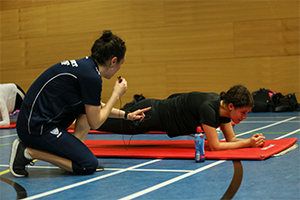 For our full fitness class timetable, visit our website www.mmu.ac.uk/plattlane. And it doesn’t end there! Here are some more ways you can benefit and take full advantage of your membership! We offer 25% off sports hall hire for all members. Meaning if you fancy changing your fitness regime up a bit and bringing a group of friends down for a game of badminton, basketball, netball, volleyball or futsal, you’ll receive 25% off the sports hall hire price! As mentioned before, our great staff offer extensive knowledge in all things fitness. And they offer individual one to one or group personal training! So if you feel you need an extra bit of help to achieve the goals you want, personal training may be the answer! Students can pay on their met card, so if you are tight on cash while at university paying on met card may be the most affordable way to join a gym. Our members will be the first to hear about any promotions we have on at Platt Lane. When there is events on, sales or offers, such as our current free badminton sessions on Thursdays and Saturdays, members will know all about what’s going on!